This model has been recoded using the nondimensionalized equations. This was suggested by the author to help with solving the problem, due to its very stiff nature. Some but not all output from the paper can be reproduced by this model. Values of s1 and s2 have been set to zero to represent a non-treatment situation. A value of 0.02 has been given to the variable c, which defines the antigenicity of the tumour, to represent the middle of the range given for this parameter. The model may be re-parameterised to give other relevant outputs, for example, if s1 is greater than 0 while s2 equals 0, the model can simulate adoptive cellular immunotherapy. The model will not run in COR due to time being defined as dimensionless. ABSTRACT: A number of lines of evidence suggest that immunotherapy with the cytokine interleukin-2 (IL-2) may boost the immune system to fight tumors. CD4+ T cells, the cells that orchestrate the immune response, use these cytokines as signaling mechanisms for immune-response stimulation as well as lymphocyte stimulation, growth, and differentiation. Because tumor cells begin as 'self', the immune system may not respond in an effective way to eradicate them. Adoptive cellular immunotherapy can potentially restore or enhance these effects. 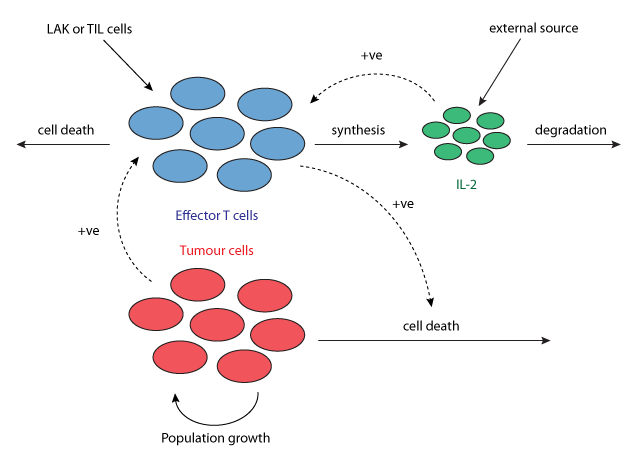 We illustrate through mathematical modeling the dynamics between tumor cells, immune-effector cells, and IL-2. These efforts are able to explain both short tumor oscillations in tumor sizes as well as long-term tumor relapse. We then explore the effects of adoptive cellular immunotherapy on the model and describe under what circumstances the tumor can be eliminated. Derived from workspace Kirschner, Panetta, 1998 at changeset eaf570098a1d.